Mike Seaver has all the answers. Kirk Cameron knows what causes school shootings: Atheism. He's also going to scientifically prove that God exists in an upcoming debate. I'm of two minds about it -- obviously I think it's awesome to get kids excited about books, and it's fantastic publicity for the authors, but I can't help feeling a little icky about the whole thing being a great big Scholastic advertising campaign. Oh, wait. I feel less icky. They're donating up to 50,000 copies of the book through Reading is Fundamental. Okay, okay. They win. So, Al and Scholastic, I give you leave to go for it. Promote the crap out of reading. Yee-haw! But I still want to know about Al Roker's secret kiddie fanbase. You know how sometimes you wake up from a particularly vivid dream and as hard as you try, all you can remember is an image? And then, days later, you'll be washing the dishes or doing something similarly zen and the whole dream will come back to you? 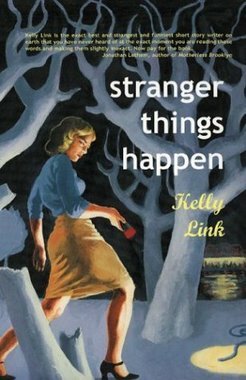 That's what Kelly Link's stories are like for me. A man on a beach. A tackle box full of prosthetic noses. Black dogs in a library. A floppy hat decorated with teeth. A middle-aged, plump Venus. A pair of thigh-high black boots. The Snow Queen, Cinderella's prince and the Twelve Dancing Princesses. Nancy Drew. A Chinese restaurant. Envelopes with the stamps cut out. A naked ghost and a cello. A fireplace. Spooky and funny and and painful and melancholy and hopeful. She's a special one -- I haven't read anyone like her. Feel free to jump in here -- write a haiku about something work related that you HATE. Still reading the Joan Aiken. The stories in A Necklace of Raindrops are geared pretty young, and would make great read-alouds. There was once a little girl called Emma Pippin. She had red rosy cheeks and brown hair and she lived with her Aunt Lou. They were very poor, too poor to buy a house, so they lived in an old bus. The engine would not go, but it was a nice old bus and they loved it. they outside of the bus was painted blue, the inside was painted white, and the windows had orange curtains. They was a stove that kept them warm and whose smoke went out of a chimney in the roof. It stood by a high white wall. Inside this wall were many lovely green apple trees, on which were growing many lovely red apples. The apple trees were owned by a proud, grand man called Sir Laxton Superb. You can see it all, right? Even the character names created a picture in my head. The rhyming and the rhythm and the repetition in "The Elves in the Shelves" would make it super-fun, and most of the others feature a situation that repeats (like "A Bed for the Night", in which a group of traveling musicians look for a place to sleep), which is also a great story-type for read-alouds. The stories have the feel of old folk tales -- Baba Yaga (or someone very like her) even makes an appearance -- so they feel comfortable, but still original. Kevin Hawkes' black and white illustrations are fab. There's one on almost every page, and he clearly knew the material very well. They have rounded edges, so they're soft, but they're still clear and detailed. It's just a nice little book, period. God help me, it just makes me like him more. Why is that? If it had been Russell Crowe, I'd find it annoying. But Hugh -- it's just hilarious. Oh, and while I was looking for more on Hugh, I discovered over at Snarkfest that some people refer to Freddie Printz, Jr. as Freddie Pajamas. It made me laugh way too much. Al Roker, Oprah for Kids. "Scholastic is proud to join with 'Today' to promote summer reading," stated Francie Alexander, Scholastic Chief Academic Officer. "Al Roker is likely to do for kids' reading what Oprah has done for adults' reading!" Have I missed something? Is Al Roker hugely popular with kids?